Our food regulator, Food Standards Australia New Zealand (FSANZ) is failing to ensure that the food we eat is safe and properly labelled so that we can make informed choices. The Food Intolerance Network has joined with eight other organisations to change how FSANZ does business. FSANZ consistently puts the interests of big business before public health. The agency has allowed the rapid introduction of new ingredients with minimal or no testing - including genetically modified and nano-ingredients. It allows food ingredients that are banned or restricted in other countries for safety reasons – including food additives and trans fats. It has failed to regulate pesticide residues and food irradiation in a precautionary and pro-active way. FSANZ has also failed to ensure that labelling laws provide us with the information we need. We want to change the way FSANZ does business and we need your help! 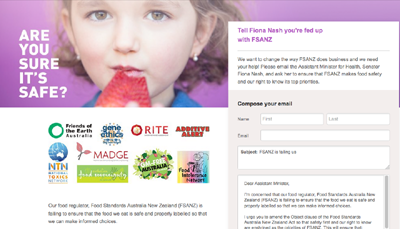 Please email the Assistant Minister for Health, Senator Fiona Nash, and ask her to ensure that FSANZ makes food safety and our right to know its top priorities. Thanks for your help and watch out for updates over the coming months.